Wait, How Are They Going to do Tceles-B Hsup? 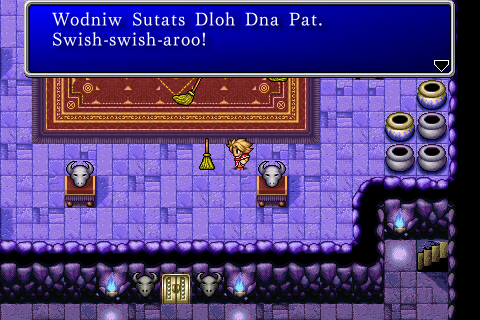 One of the things in Final Fantasy was a "magic spell" taught to you by a broom that told you to Tceles-B Hsup - "push B-select" backwards. It brought up the world map. How can they do that on the iPhone? Read more about Wait, How Are They Going to do Tceles-B Hsup? Hm... I may need to add an iPhone section under games. I'm glad to see the Java StAX documentation is proffread - because it certainly isn't proofread. Two examples are below, one from XMLStreamReader, and another from XMLOutputFactory. 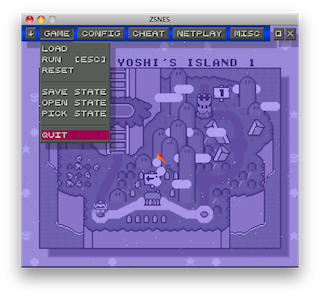 ZSNES is a cross-platform (well, cross-OS, since it's written in assembly - so x86 only) Super Nintendo emulator. Since it can be compiled for Linux, it stands to reason it can be compiled for Mac OS X. And it can. More (including a DMG) after the jump. I guess Sony updated the PlayStation Network avatar thingy (they call it a "portable ID" - whatever). Aw yeah. 1 Platinum trophy. Slashdot has a very interesting story about a poor system administrator who was fired for running SETI@Home. You see, the evil management types found it to be a waste of their resources, claiming that it caused $1 million worth of damages! Doesn't sound very fair, does it? In Stargate Universe, they recently attempted to dial home to Earth by using the power of star, creating the wormhole from within the star. The very next episode, they mentioned that solar flares can cause the wormhole to bounce back and travel through time. So, wouldn't dialing from within a star contain a somewhat heightened danger of accidental time travel? OK, so solar activity is somewhat unpredictable, and presumably varies from star-to-star, so the risk might be somewhat limited. Man, I managed to completely miss this, but Geocities has shut down as of today. I remember when I put my first website up on ... OK, not on Geocities, but on a local ISP. Using hand-written HTML. But still with a bit too much annoying-graphical flair. (Specifically with the over-patterned backgrounds. Yes, I know I did that here last Christmas, this Christmas will be better. I hope.) So, here it is, my tribute to Geocities closing down. I mentioned it. That's my tribute. The end. I've been playing around with the HTML5 <video> element. This is a test of a script that should - hopefully - use the <video> element first, and then fallback to a Flash player if that isn't available. You may recognize the video as one of the Omnislash Version 5 videos. Read More for the video.